Who is the current Norris favourite? There's still a couple of hours left in my Twitter poll so you can participate if you hurry, but the early results point strongly to Karlsson, and surprisingly far away from Doughty. Getting more into the details, Travis Yost of TSN took an interesting look at how defensemen are being used this season, and had some interesting findings. His work also appears to confirm that more teams are adopting the Predators model of relying more heavily on their top defensemen. Rather than roll three pairs, the Predators leaned heavily on the top two pairs, rarely using Matt Irwin and Yannick Weber at all. It seems like more teams are doing that these days. 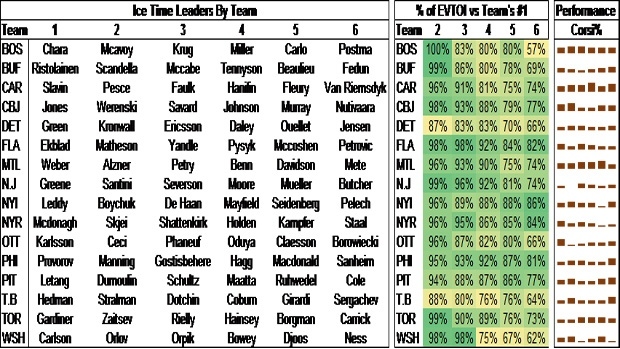 Yost based each team's depth chart based on average ice time, computed what percentage that represented relative to the team's No. 1 defenseman, and even took a look at each player's shot-based results. Even if you're not as interested in the numbers, it's interested to scan vertically and compare one team's No. 4 defenseman (for example) to another. It's also fun to look for surprises, like depth defenseman in the top four (e.g. Matt Tennyson, Joakim Ryan, Jan Rutta), and top-four defenseman slotted on the third pair (e.g. Marc Staal, Cam Fowler, Dan Hamhuis, Kris Russell, Tyler Myers). Steve Burtch (@steveburtch) also took a look at defensemen this week, using the xGA/60 RelT stat. Don't get too worked up by the confusing term, because it's basically just the team's relative GAA when the player is on the ice. That is, Seabrook's 1.00 means that the team's GAA is +1.00 when he's out there. Now, that may be because of his play, or it could be other factors -- this is just information, and it's up to others to put it into context. To be slightly more specific xGA is the expected goals against, not the actual goals against. First developed by Alan Ryder back in 2004 but raging back in popularity recently, expected goals is the number of goals that an average goalie would have allowed, given the volume, location, and quality of shots allowed. Here, it is calculated on a per-60 minutes basis (/60), just like GAA, and measured relative to the same figure when the player was off the ice (RelT). In essence, this list includes the defensemen with whom scoring goes up the most when they're on the ice. So, it's not a good list to be on. In some cases, they also improve scoring (xGF/60 RelT), but not by enough to justify that extra scoring allowed. In fairness, in some cases the player is simply being tasked with all the tough minutes, possibly with a lousy partner, and maybe had some bad luck in the early going. But, in other cases, some players are legitimately struggling and should be moved down the depth chart. What the heck is wrong with the Oilers? They're 7-12-2 and 29th in the NHL. It was a popular topic with my Twitter followers (1,223 votes), and the most popular answer is definitely a lack of scoring depth. They're fine with McDavid on the ice, but struggle with anybody else. A lot of people wanted Peter Chiarelli to be one of the choices, but he's not on the ice. If you believe the GM is to blame, what exactly did he do (or not do) to cause their early struggles? Indeed, the team's lack of scoring depth could be blamed on the man who traded away Taylor Hall and Jordan Eberle, and let Benoit Pouliot go. Even if you blame the top four, Chiarelli was the one who threw a lot of long-term money at Kris Russell, who is being used a secondary option no more often than Matt Benning, even in Andrej Sekera's absence. I don't disagree with either of those sentiments, but it is early, and they have had a lot of bad luck. In my view, they should be just fine the rest of way. The only question is whether or not they dug themselves too great a hole to climb back into the playoffs. With Kariya being officially inducted into the Hall of Fame, there was some attention on his incredible 1995-96 season, in which he led the team in scoring by 64 points. As a 21-year-old in his second season, Kariya scored 108 points (50 goals, 58 assists) in 82 games, which is 64 more than Steve Rucchin, who was in second place with 44 points (19 goals, 25 assists) in 64 games. Where does that rank in NHL history? 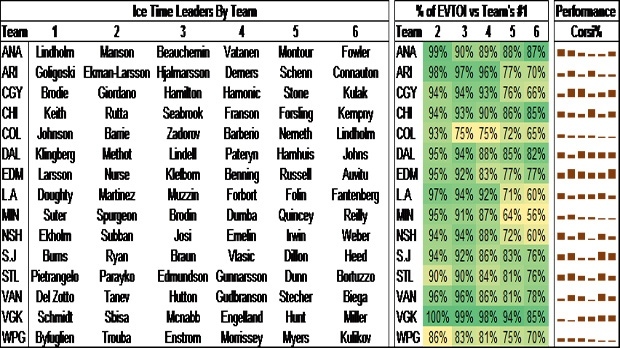 After invoking the Gretzky-Lemieux Rule, which excludes their exceptional results from the analysis, it is the greatest gap between first and second in team scoring. Here's the leader board. I'm also asked about Sakic's 1989-90 season, who scored 102 points (39 goals, 63 assists) in 80 games, which is 66 more than second-place Michel Petit, who had 36 points (12 goals, 24 assists) in 63 games. However, people forget about Peter Stastny, who had 62 points (24 goals, 38 assists) in 62 games when he was traded to the New Jersey Devils at the trade deadline. So, I think the gap is actually 40 points, on a technicality. For those who remember Iain Fyffe's writeup about the Hall of Fame Inductinator in Hockey Abstract 2014, Kariya should have been voted into the Hall of Fame long ago, based on an assessment of the subjective criteria of the voters. Almost everybody agrees that the New Jersey Devils are this year's Toronto Maple Leafs, in the sense that they are getting the biggest boost from their rookies. At the moment, the Devils are tied for first in the Metropolitan division, which absolutely no one expected. And, it's not just first overall pick Nico Hischier and his 15 points - he's being outscored by rookie third-pair defenseman Will Butcher, 16 points. There's also two-way forwards Jespter Bratt with 13 points, and depth forward Blake Coleman, who is plus-11. They also have a lot of young, second-year players. Keep an eye on the Devils! Here are the 5-on-5 points per 60 minutes leaders as of November 20. Data source is Natural Stat Trick, and minimum is 10 games played. In the summer, I raised eyebrows by arguing that the Habs should have traded Price, rather than sign him to that huge contract. They could get a huge return on Price, find a younger and lower cost goalie, who goalie coach Stephane Waite could easily train into a solid No. 1. They could use the savings to solve the team's problems elsewhere in the lineup. Well, the eyebrows are going down, because Price's slow start (which is temporary) has apparently gotten a few people on board. Last year's divisional champions are having a hard time this year. As of today, Montreal, Washington, Chicago, and Anaheim have a combined record of 39-37-8, and have been outscored 256-233. I also noticed that Dallas is outscoring its opponents 44-34 through the first two periods, but have been outscored 26-13 in the third. In individual player notes, Mark Letestu has now played 152:06 at 5-on-5 with Edmonton scoring a goal while he was on the ice (source: Natural Stat Trick). Joey Kenward (@kenwardskorner) pointed out that Antti Niemi has now played for three teams this season, only the fifth goalie to do so, after Jim Rutherford, Greg Millen, Kirk McLean, and Sean Burke.